The 28-year-old has maintained last year’s excellent form with three stage wins already in 2019. The Bora-Hansgrohe rider secured his third stage win of 2019 on Tuesday. IRELAND’S SAM BENNETT continued an impressively consistent run of form on Tuesday as the Carrick-on-Suir cyclist stormed to victory at stage 3 of Paris-Nice. The 28-year-old won the final stages at the Vuelta a San Juan in Argentina last month, as well as the final stage of the inaugural UAE Tour ten days ago. This afternoon Bennett secured his third victory of 2019, blowing the competition away with a confident bunch sprint finish, placing ahead of Australia’s Caleb Ewan and Fabio Jakobsen of the Netherlands. “I had really bad legs the last two days,” he told VeloNews.com. “I knew that the form was there and I had to just keep trying. “Today, the legs were a lot better — okay it was a lot easier. But I’m starting to get used to the cold weather. Today was my last sprint opportunity, and I did everything I could. “It’s nice to come back and to win again here. Strong competition here and last week [at the UAE Tour]. I’m starting to show I can compete with the best. Last year Bennett enjoyed his most prolific year in cycling since turning professional a decade ago, claiming three stage wins at a Grand Tour at the 2018 Giro d’Italia. 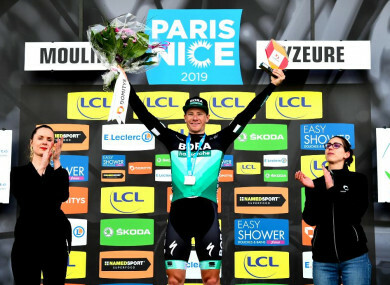 The Bora-Hansgrohe rider finished with a time of 5:16:25 over 200km today, with the victory marking his second stage win at Paris-Nice having previously claimed stage 3 at Chalon-sur-Saône after 190km back in 2017. Email “Ireland's Sam Bennett continues electric form after storming to stage win at Paris-Nice”. Feedback on “Ireland's Sam Bennett continues electric form after storming to stage win at Paris-Nice”.